Please contact us for detailed nutritional information, ingredients lists, product specification sheets and product photos. Our products contain natural ingredients. They are frozen to extend life before they leave the bakery. 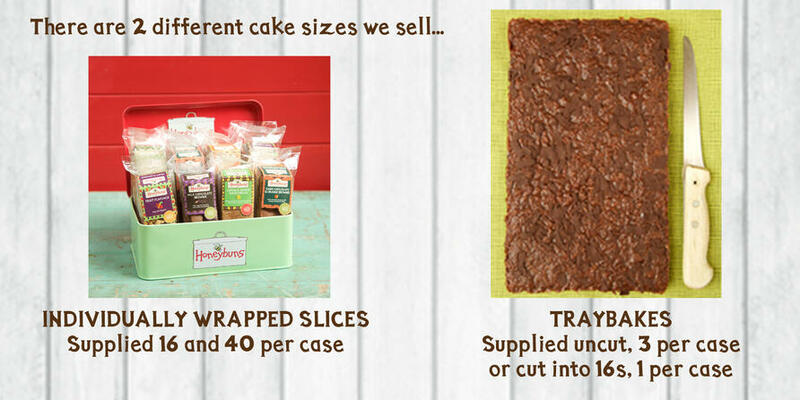 Our cakes are supplied frozen, and will take up to 3 hours to defrost at room temperature. Once defrosted, a best before date should be calculated using the information on the outer box. For individually wrapped cakes, a best before label should be applied to each cake, over the film wrapper in the 'Best before date:' space. For traybakes, a best before label should also be applied. Once these are opened however, keep covered and use within 5 days. Please keep our cakes away from direct sunlight and high temperatures. Please don't let our cakes melt! 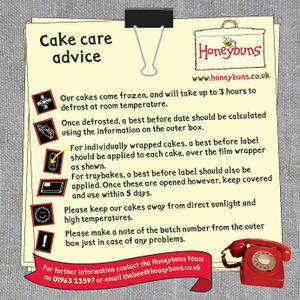 In case of any problems with your cakes, please record the batch number from the outer Honeybuns box. We can trace the batch in question. Call us if you need shelf life information. Download our Cake Care advice. Everything we make is gluten free, and we also have a range of dairy free products available. Allergens we handle on site are: peanuts, nuts, egg, milk, soya, sulphites. All our production either contain, or may contain, peanut and other nuts. Once the wrapper is removed from the cakes, it is your responsibility to keep the cakes allergen free. 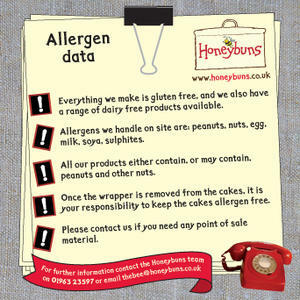 This Allergen data can be downloaded here. Allergen and ambient shelf life info for all our products can be downloaded here. 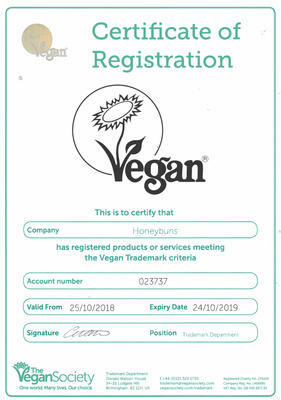 Our vegan cakes and traybakes are all registered with the Vegan Society. You can find our Vegan FAQ's here. Read our Sourcing Policy here.